BOISE – Construction is underway on improvements to the Cloverdale Overpass bridge and Cloverdale Road between Franklin Road and Camas Drive. The Ada County Highway District and the Idaho Transportation Department transportation are joining together to replace and widen the damaged Cloverdale overpass bridge, and widen and improve the sections of road adjoining the bridge. Cloverdale Road will remain closed between Franklin Road and Camas Drive during construction, but one lane of travel in each direction will be open by June 15, 2019. Details of the improvements are listed below. The public will experience immediate impacts of the construction as crews demolish the damaged bridge over Interstate 84. All eastbound lanes and two westbound lanes of I-84 will be closed overnight Monday (December 3) from 9 PM to 5 AM Tuesday morning. All westbound lanes and two east bound lanes of I-84 will be closed overnight Tuesday (December 4) from 10 PM to 6 AM Wednesday morning. Please refer to the map below for detour routes. Idaho State Police will increase patrols to promote safe driving behavior in the work zone. The work zone may contain hidden hazards and the public is advised to stay out of the area. 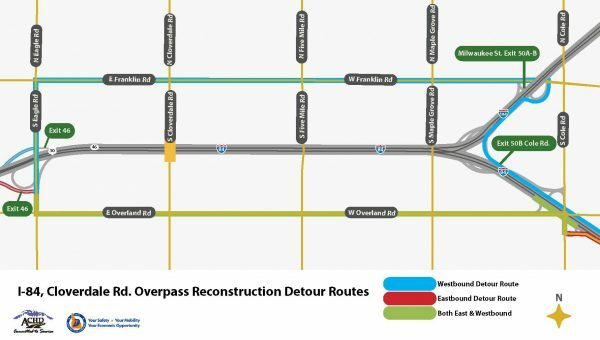 Pedestrian and bicycle traffic has been allowed to use the existing Cloverdale Overpass, but following demolition that route will be unavailable. Throughout construction, access to local businesses and residences on Cloverdale Road will remain open. The work will include, but not be limited to: general construction noise, dust, equipment backup alarms and ground vibration. There may be some night work, but typical work hours on Cloverdale Road will be 7 AM to 8 PM. This joint project has been awarded to Concrete Placing Company, Inc. out of Boise for $10.3 million. Project information and the opportunity to sign up for email updates can be found online at: http://www.achdidaho.org/Projects/proj_road_cloverdale-road-franklin-road-to-camas-drive.aspx.